Thread: Need help when use isa-to-usb card in IBM 5160! This is how you can mod the card so the address decoder works. It involves soldering 1 74LS11 chip to the card. If the bios provided by the manufacturer works with the 8088 and 8086 you still need to change a few bytes in the bios if you want to use it on a different i/o address but that is all mentioned in the readme. I was about to say that a few bios changes may be needed. Going through the disassembly now. (edit) see I should read READMEs first. The I/O address is in the BIOS file at 0x38-0x39. Duh! (edit2) it would be cool if we could change that dynamically. I have an idea or 2 on how to do that. Last edited by jh1523; August 18th, 2015 at 02:10 PM. According to a sticky thread IBM-PC-XT-5160-BIOS-versions there are four versions of bios,only the last two support 720k floppy.I'm afraid mine is not that version,you can see the U19 chip picture I upload before ,it has a part number 5000027.I guess boot from.3.5" 720k floppy may not work. (edit)Is there a another way to do it ,like reporgram or replace the little chip in the bottom left? Last edited by ineverland; August 18th, 2015 at 04:37 PM. Please share your ideas ,maybe this card can come to life with your help. I make a phone call to the ch375 technology support,He claims an interesting thing. the line "Press CTRL to start E-DISK" is printed by the card bios as he said. So the bios rom is called by system,but the card can't recognize the usb disk. I'm confused now,If this line is printed by the bios rom,why I can't find these words in the bios rom file? (edit)it's ok if system can boot with 96kb memory recognized. what's the meaning of these lines? Last edited by ineverland; August 18th, 2015 at 06:08 PM. Engineer from WCH(ch375 producer) gives me a new bios rom file,it's different from the one pietja uploaded before. There are words "Press CTRL to start E-DISK" too. Last edited by ineverland; August 18th, 2015 at 07:15 PM. I wonder if they might make the BIOS open source. The lines are produced by the BIOS ROM on the 5160 motherboard, specifically the power-on self test (POST) component of it. Why? Because CH375ROM.BIN is not meeting a requirement of the 5160's POST. Background: The information at [here]. 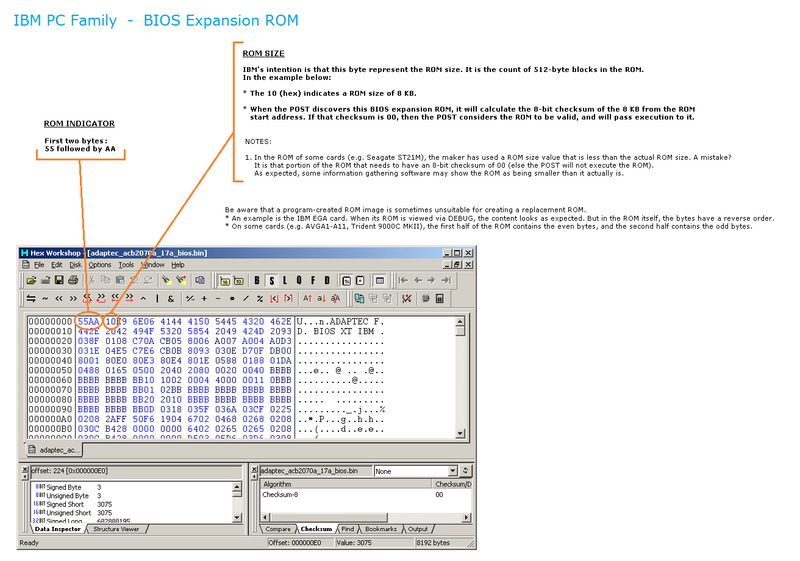 Requirement: The IBM 5160 (and final 5150) POST is coded such that it requires that the 'ROM size' byte in BIOS expansion ROMs be a multiple of 2 KB. CH375ROM.BIN is 3 KB sized, and accordingly, its third byte of '06' indicates 3 KB. If 'ch375 technology support' will modify things so that everything (code size, third byte, checksum byte) reflects 4 KB, then the 'xxxxx ROM' lines will disappear. How do I know this? Because we have seen this symptom before, at [here]. Thank you modem7,Things are getting more clearer ,I reproduce the same error in an IBM XT emulator called "PCE". I load the CH375ROM.BIN at 0xd8000,it's can be done with cfg file. I test two xt bios:ibm-xt-1986-05-09.rom/ibm-xt-1982-11-08.rom. ibm-xt-1986-05-09.rom didn't produce xxxxx ROM,as modem7 said in XT-FDC project. ibm-xt-1982-11-08.rom behaves exactly the same as my 5160. CH375ROM output a line "Press CTRL to start E-DISK",so I think even the rom size byte is 3kb (not a multiple of 2 KB),XT bios still called the rom bios. But pressing CTRL key makes no difference,ROM BIOS seems not doing anything after CTRL been pressed.System continue to boot from fdd or hdd or BASIC rom. this is the 2k version BIOS ROM pietja uploaded output. look inside the rom files,you can find the 3kb version bios is v1.5,the 2kb version bios is v1.3. Last edited by ineverland; August 19th, 2015 at 01:45 AM.